originated this whole thing; Lisa and JC were invited to join them after the concept was done. JC was the last to join in, as she was on her honeymoon and it took awhile for her to connect. They DID contribute, but they did not create the blogfest nor the idea of Renaissance. That was already established: stories done within the same mythical town, RENAISSANCE. I especially find it interesting since all of my novels exist in the same mythic universe, too. Ouch! All right, Alice : two heroes and One HEROINE to fend for themselves in the eerie community of RENAISSANCE. "This is Renaissance?,” said Victor Standish, his face puckering as if he had bitten into a pickle. He had a point. I had brought us to the woods bordering the Country Club, a modest monument to the greed and prejudice of the White Man only a little less large than a football field. I made a pickle-face myself. I had been spending too much time with my Apache blood-brother, Elu. I eyed the black mists curling and creaming in the night air like an unspoken fear trying to form itself on the edge of consciousness. A trick of the polluted air, the moon of blood leered down upon its reflection on the black waters of the bordering lake. I smiled. Alice might be a ghoul, but she was a prim and proper Victorian ghoul. Victor winked at her. While they were distracted, I folded space like a tablecloth. My head went light. The marrow in my bones became acid. But we were inside without being molested by any … surprises. I had brought us to a modest drawing room the size of Missouri. Rubies and diamonds sparkled on ivory throats and wrists like drippings from the sea. The graceless noise of the latest pop music was interlaced with the rise and fall of empty conversation and brittle laughter. I looked at the ebb and tide of desire upon wealth, greed upon opportunity. The social elite milling through the room seemed to be talking against a darkness that pressed in on them or pressed to escape from within. “This part of Renaissance used to be a ghost town,” I said low. Victor eyed a portly businessman slipping off his wedding ring as he approached a girl hardly old enough to be a cheerleader with a dress just as short. What a mixed bunch of characters. Quite a dark setting to start of with. I like it. You're setting us up for something, and I want to know what. I don't know these characters prior to this short, but I like them. A lot. I've always found life has a way of showing us those around us are wearing a variety of masks! I'm glad you liked my contribution. The clue have been sprinkled. The board set. The fur is about to fly. It's going to be a bumpy ride! You know, those bumps you hear in the night. I'm happy you enjoyed this first act. Every city is different things to different people. My three heroes just are magnets to the supernatural, no matter their setting! My Renaissance is part TWIN PEAKS, part SALEM'S LOT, and all TWILIGHT ZONE! LOL. Glad you liked my version of the city. Don't take Maija's similarity to your name personal. She's been my Dragon Lady for years. And while she is vicious, there are always THINGS more vicious in this strange world. I'm very pleased you liked my set-up. Roles are about to be reversed. Victor is so NOT worried -- the scamp! LOL. Thanks for following! I'm glad you liked my supernatural THREE MUSKETEERS. Ah, in McCord's case, he's a Texas Ranger. In the next segment, the mayor accuses him of being undead. To which Victor snaps, "No, you smuck, he's just got the blood of my mother, Death, in his veins!" Ah, now I remember why I was looking forward to your entry :). Awesome writing, as usual. Kudos! 'I folded space like a tablecloth' - what a fabulous line. It says so much in so few words.
. . . and can a ghost really die again? but no, we've gone back in time, surely? So many questions . . . Your comment made my morning! Your entry was wonderful as well. Bravo. Thank you for such nice praise. 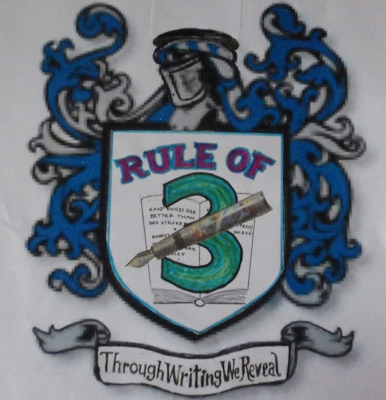 I had to make one word do the work of 3 in this blogfest -- which is fitting considering its title! I enjoyed this...will be back for more. I love this new blogfest idea too! And your entry is excellent. I'm dying to know how they get out of this one! Oh how I loved this! Can't wait to find out how this snarky bunch fares in Renaissance! More!! more!! Great! Very entertaining and funny! I love the characters and your style! Sweet! You're doing this, too! Awesome. I love your entry! Great cast of characters; and what a suspenseful ending! Crap, did I miss your entry for the support group today...? Your world building in your entry was intricate and absorbing! Victor uses his wit as a buffer against the darkness. Yes, the Big Picture usually chews up the little people! No. My Support post is tomorrow. I didn't want to blunt the meaning of tomorrow's words. Ilove your take on Renaissance Roland. Next week will be interesting. This is a note to say that I’ve been by to read your entry. As one of the judges, I don’t want to make any specific comments that could betray my judgement — keeps you guys in suspense for longer! :) Suffice it to say that I’m truly enjoying all the different and creative takes on Renaissance and the Rule of 3! P.S. : Might I say though that I like how you used your regular characters in this! I like your detailed observations of human nature. I'm also looking forward to more about Alice in particular. (And bus rides ARE to bumpy.) :-) Great intro. Next week will literally be a hell of a time! My magnificent 3 were more than happy to visit Renaissance. Ouch! Alice nibbed off an earlobe, saying, "Speak for yourself!" Clever, funny, a little dark. Your characters have tons of personality. This definitely makes me want to know them better! Dark and humorous.... great combo. Made me think of a sort of picnic with your characters.... and I am wondering what other than sour pickles there is from the canteen. Roland, you have my attention. A wild ride is at hand, I believe. I only hope I am ready for it. There's something in your language that reminds me of Michael Marshall Smith's writing - I will be back! Thanks for letting us read this bit! I liked the sense of the darkly macabre and the elegant everyday mixing. And, as a bit of unsolicited feedback, loading your blog seems to take a toll on my several-years-old laptop. :( I understand you being excited about your trailers, but including five of them in the header for the page to read your blogfest entry seems like a little much to me. Take with a teaspoon of salt, of course. Clever, funny, a little dark -- that's Victor Standish all right. I hope you tune in next week. Glad Sam, Victor, and Alice have your attention. And watch out for Maija ... and the mayor is not all he seems! Michael Marshall Smith? I'm honored. I hope you enjoy next week's entry. I appreciate all criticisms. But a very wise man once said not to put a basket over your candle but to put it at the top of the hill for all to see. But I promise not to post any more than 5 trailers at a time! LOL. Love that "it is underhanded and sly." You lulled me in right up to the ending - can't wait to see what happens next week! I'm still at work so visiting other blogs is denied me. But I will make it to yours! Then, you'll love Victor since underhanded and sly are his bywords! Next week will be hell-raising ... literally.